Bottlenose Dolphins are aquatic mammals. Size: Male bottlenose dolphins tend to be longer and heavier than their female counterparts. Bottlenose dolphins are approximately 8 feet long and weigh 440-660 lbs. 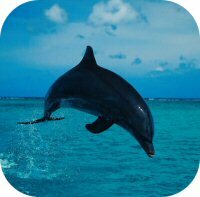 Habitat: Bottlenose dolphins can be found in temperate and tropical waters throughout the world. They prefer coastal waters that are warm and shallow. Diet: Dolphins are predators and eat fishes, squids, and crustaceans. Their diets can vary based on their environment and the available food sources. Adult bottlenose dolphins eat 4-5% of their body weight each day. A nursing mother bottlenose dolphin can eat as much as 8% of her body weight each day. Senses: Bottlenose Dolphins have an acute sense of hearing. They have acute vision both in and out of the water. Their sense of touch is well developed. Bottlenose Dolphins have a limited sense of smell. Bottlenose Dolphins use echolocation for navigation, it can be thought of as similar to a built in radar system. Description: Bottlenose Dolphins are dark grey on the top side, and they vary to a light grey on the underside. Bottlenose Dolphins have a layer of blubber that makes up approximately 18-20% of their body weight. Communication: Bottlenose Dolphins produce clicks and sounds that resemble whistles, moans, trills, grunts, and squeaks. They are able to communicate with their pod using these sounds. Bottlenose Dolphins can jump out of the water up to 20 feet into the air. Hunting: Bottlenose Dolphins are highly social and a pod of dolphins will often work together to herd a school of fish, trapping them in shallow waters. Gestation: Bottlenose Dolphins carry their young for 12 months. They typically breed for reproductive purposes every 2-3 years. Birth: Bottlenose Dolphin calves are born tail first. They are 3-4 feet long and weigh about 44 lbs. Calves: Calves will nurse for up to 18 months, and they typically stay with their mother for 3-6 years. Sexual Maturity: Female Bottlenose Dolphins sexually mature at 5 to 12 years of age, while male Bottlenose Dolphins mature at 10 to 12 years of age. Life Span: Bottlenose Dolphins can live in excess of 40 years. Dolphins can suffer from viral, bacterial, and fungal infections. In addition, they can have many diseases found in humans including: stomach ulcers, skin diseases, tumors, heart disease, urogenital disorders, and respiratory disorders. Some shark species including: tiger sharks, dusky sharks, and bull sharks all prey on Bottlenose Dolphins. Pollution and habitat destruction, also impacts the life span of Bottlenose Dolphins. Fishing nets can also cause the deaths of Bottlenose Dolphins. The nets trap the Dolphins and they are unable to get to the surface for air. Social Structure: Bottlenose Dolphins are highly social and they live in large groups called pods. The size of the pod can vary, and can be influenced by the depth and openness of the habitat. Several pods may temporarily join together to form a larger group called a herd or aggregation. The larger adult males in a pod will patrol the outer edge of the pod to provide protection. Bottlenose Dolphins can develop strong social bonds with other dolphins in their pod. Athleticism: Bottlenose Dolphins can swim up to 18 mph, and jump up to 20 feet out of the water. Unusual: Bottlenose Dolphins can voluntary breathers. They breathe when they are half sleep, during the sleeping cycle, one brain hemisphere remains active, while the other hemisphere shuts down. The active hemisphere controls the dolphin's surfacing and breathing behavior. The Bottlenose Dolphin typically surface to breathe 2-3 times per minute, but can remain under water for up to 20 minutes.